Twitter rang in Data Privacy Day by updating its transparency report with another round of numbers and some changes in how it presents the figures. The report gives a view on the number of user information requests made by governments around the world. Also included are requests to remove illegal content and copyright violation notices the company receives. As for the changes, the transparency info was moved to a new homepage. Twitter made the data more visual, and the new site is littered with graphs and charts to help users digest the info. The social media site also added more detailed information on how the United States asks for this data, whether through subpoenas, court orders or search warrants. This is the second transparency report from the social network since it started releasing this sort of data in July. The first report focused on the first half of 2012. Just like last time, Twitter gave the global numbers while the information is broken down by country for users to sift through. From July to December of 2012, Twitter received 1,009 requests for users' information from governments around the world. That's up from 849 requests made in the first half of the year. To put that into context, Twitter has about 200 million monthly active users, according to an official tweet from last month. These information requests are generally for criminal investigations, but are also sometimes used in emergency cases. Of those 1,009 requests, 57 percent produced at least some information to authorities. Of the 849 requests from the first part of 2012, at least some data was produced about 63 per cent of the time. The company received 42 request to remove illegal content in the last part of the year, compared to six removal requests from January to June of last year. 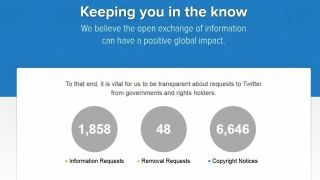 In later 2012, Twitter got 3,268 copyright notices, down from 3,378 earlier in the year. For some perspective, Google reported its transparency numbers last week. The search engine received about 21,000 user information requests in the last half of 2012, producing some data 66 per cent of the time. But Twitter isn't the only company taking note of Data Privacy Day. Google also published a new Legal Process FAQ on its own transparency site, which Twitter emulates. The new FAQ is a guide through the legal processes involved when governments request user data. It explains what Google does when it receives these requests and what governments need to do to get access to the data. One of the more informative sections breaks down what types of data the U.S. government can request through different legal processes. For example, a subpoena can force Google to disclose a user's registration info on YouTube, and a court order can reveal the contents of Gmail messages. It's a good breakdown of the whole legal process involved and gives an insight into how companies in general deal with these requests. It's also a good place to start if you know you were targeted by one of these requests. But, as both Google and Twitter noted in blogs, these reports are more about starting conversations than reporting numbers. "It's our continued hope that providing greater insight into this information helps in at least two ways: first, to raise public awareness about these invasive requests; second, to enable policy makers to make more informed decisions," Jeremy Kessel, Legal Policy Manager, wrote on the Twitter blog. Ooo, "invasive." We like the language.